Equity CrowdFunding the process whereby people (the “crowd”) invest in an unlisted company (a company that is not listed on a stock market) in exchange for shares in that company. WHAT IS 'REGULATION A' ? An exemption from the registration requirements mandated by the Securities Act, applicable to small public offerings of securities that do not exceed $5 million in any 12-month period. A company that uses the Regulation A exemption for a securities offering must still file an offering statement with the Securities and Exchange Commission. While Regulation A offerings share some characteristics with registered offerings, they have some distinct advantages over full registration. Raise up to $50,000,000 in a 12 month period for Tier II and $20,000,000 for Tier I. In exchange Act there is no reporting requirements until the company has more than $10 million in assets. You need to budget for Campaign development, marketing and promotion, legal and accounting fees. 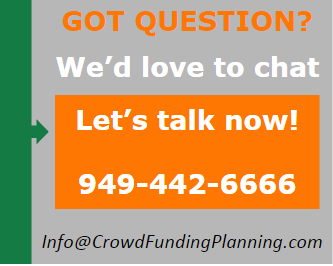 What is Equity CrowdFunding under Reg A+ Tier II and Tier I? High Maximum Raise: Issuers can raise up to $50,000,000 in a 12 month period for Tier II and $20,000,000 for Tier I.